The majestic Arthur Ravenel, Jr. Bridge is not only an iconic structure in Charleston, SC, it is an awe-inspiring image that’s become practically synonymous with a city that consistently ranks as a top travel destination. The Ravenel not only links downtown Charleston to Mt. Pleasant but connects points further south to the northern states via Highway 17 that crosses through the bridge. 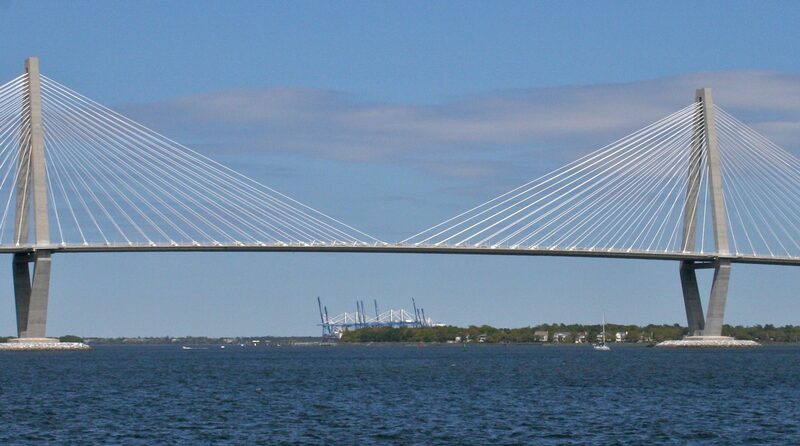 The bridge, built in 2005, is named after former South Carolina Senator Arthur Ravenel, Jr., a retired U.S. Senator who dedicated his campaign and his term in Congress to raising the $600 million needed to turn the dream of a modern, eight-lane bridge into a magnificent reality. The Ravenel Bridge replaced an old, dilapidated and dangerous original structure built in 1929, known as the John P. Grace Memorial Bridge. The original bridge, built with Ford Model ‘A’s in mind, was, years later, often referred to as a “roller-coaster bridge” because of its steep approach, sharp curves and extremely narrow width. 1n 1966, a new bridge, the Silas N. Pearman (named after the state’s Highway Commissioner) was built alongside the Grace Memorial Bridge. This additional bridge was dedicated to northbound traffic (going towards Mt. Pleasant) while the older Grace Memorial Bridge carried southbound traffic into downtown Charleston. Yet, little more than a decade had passed when neither of these bridges could safely accommodate the significant increase in traffic throughout the Charleston area. Today, the Ravenel Bridge – or the Cooper River Bridge – as it is also called – is one of Charleston’s most famous structures, drawing thousands of tourists each year to snap pictures of its immense towers and soaring white cables, suggestive of the thousands of sailboats that float through the harbor each year. The Ravenel Bridge is not only aesthetically pleasing, it is also structurally sound, designed to withstand wind gusts of 300 mph and earthquakes that hit 7.4 on the Richter scale. Certainly, the bridge has held up well each spring as 25,000 runners from around the world pound their way down the bridge’s wide lanes, closed to traffic, during the popular, annual Cooper River Bridge Run, a renowned 10-K celebrating its 40th year in 2018. Visitors and local residents who simply enjoy walking or biking will appreciate the bridge’s dedicated 3.5 mile walking/biking lane as they take in the panoramic view of the Cooper River below and the S.S. Yorktown, a World War II-era aircraft carrier, anchored in the harbor at Mt. Pleasant’s historical Patriots’ Point. The Ravenel is a perfect reflection of the city it serves, strikingly beautiful and an unforgettable, long lasting part of America’s history.